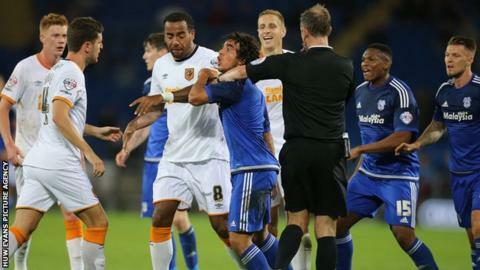 Hull City produced a clinical performance to inflict a first defeat of the season on Cardiff City. Mohamed Diame seized on sloppy Cardiff defending to fire Hull into an early lead. The Bluebirds pressed for an equaliser but were frustrated by their opponents, who sealed victory with Abel Hernandez's late drilled effort. Hull's win sees them climb to third in the Championship table, leapfrogging Cardiff, who slip to sixth. Having guided his team to three straight wins, Cardiff manager Russell Slade named the same side for the fourth successive game. But Hull were well prepared and their sturdy 5-3-2 formation stifled their in-form opponents. Cardiff were close to taking a fortuitous lead in the fifth minute when Kagisho Dikgacoi's mishit cross floated over Hull goalkeeper Alan McGregor but was cleared at the back post. An open start saw both sides attack at a high tempo, and there was an element of luck to Hull's opener. Cardiff centre-backs Sean Morrison and Matt Connolly both failed to clear Sone Aluko's cross, leaving an unmarked Diame to blast in from close range. Hull seemed content to protect their lead, the visitors' five-man defence repelling a flurry of free-kicks and corners from their opponents. The second half followed a similar pattern, Steve Bruce's organised outfit dealing comfortably with Cardiff pressure, which was wholehearted but lacked cutting edge. Dikgacoi headed wide from a Peter Whittingham free-kick and Bruno Ecuele Manga mishit a shot from the edge of the box as the home side struggled to create genuine scoring opportunities. Cardiff's bluntness in attack was punished with nine minutes left as Diame's lofted pass found Hernandez, who chested the ball down and shot low beyond David Marshall into the bottom corner. "As a manager you sometimes need a reaction from an awful performance like that aat the weekend and that's exactly what we've got. "It's a bit more like it, a bit of of resilience, a bit of bottle and they threw a load of balls into our box and I thought the three defenders with three centre-backs were terrific in dealing with that. "All round it was a really, really good performance and more like it showing that resilience that we need to win football matches away from home. It's got us up and running and lets hope it continues. "We seem to settle straight back into it which was pleasing because we've got away from it and for one or two reasons so we reverted back to tight today and it paid off." Match ends, Cardiff City 0, Hull City 2. Second Half ends, Cardiff City 0, Hull City 2. Attempt saved. Kenwyne Jones (Cardiff City) header from the centre of the box is saved in the centre of the goal. Assisted by Peter Whittingham with a cross. Offside, Cardiff City. Sammy Ameobi tries a through ball, but Joe Mason is caught offside. Allan McGregor (Hull City) is shown the yellow card. Corner, Cardiff City. Conceded by Moses Odubajo. Corner, Cardiff City. Conceded by Sam Clucas. Kagisho Dikgacoi (Cardiff City) wins a free kick on the right wing. Attempt missed. Michael Dawson (Hull City) header from the centre of the box is close, but misses to the right. Assisted by Sam Clucas with a cross following a corner. Corner, Hull City. Conceded by Sean Morrison. Attempt blocked. Chuba Akpom (Hull City) left footed shot from the left side of the box is blocked. Assisted by Moses Odubajo. Substitution, Hull City. David Meyler replaces Sone Aluko. Attempt blocked. Craig Noone (Cardiff City) left footed shot from outside the box is blocked. Assisted by Lee Peltier. Goal! Cardiff City 0, Hull City 2. Abel Hernández (Hull City) left footed shot from the centre of the box to the centre of the goal. Assisted by Mohamed Diamé with a through ball. Substitution, Cardiff City. Craig Noone replaces Joe Ralls. Attempt saved. Sam Clucas (Hull City) left footed shot from outside the box is saved in the bottom right corner. Assisted by Sone Aluko with a through ball. Attempt missed. Sone Aluko (Hull City) left footed shot from outside the box is close, but misses to the right. Assisted by Curtis Davies. Offside, Cardiff City. Bruno Ecuele Manga tries a through ball, but Joe Mason is caught offside. Attempt missed. Bruno Ecuele Manga (Cardiff City) right footed shot from outside the box misses to the left following a set piece situation. Attempt blocked. Kenwyne Jones (Cardiff City) right footed shot from outside the box is blocked. Assisted by Sean Morrison with a headed pass. Kagisho Dikgacoi (Cardiff City) wins a free kick in the attacking half. Substitution, Hull City. Ahmed Elmohamady replaces Andrew Robertson.